Forklift trucks are essential equipment for factories and warehouses. The design of the forklift has evolved from manually powered hoists, through battery powered platform trucks to modern day ergonomic designs for increased effectiveness, as well as taking into account user safety, comfort and ecological concerns. The design of concept forklifts continues to evolve with advances in technology and engineering. 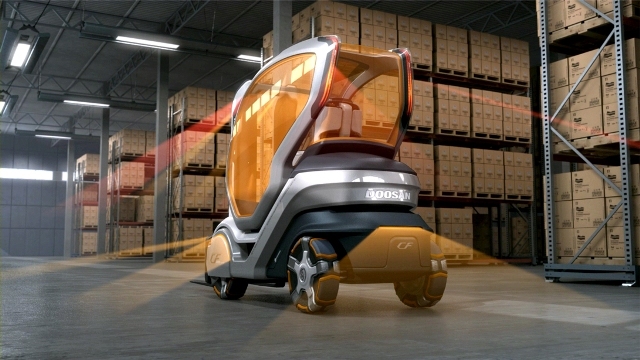 So what can we expect for the future of forklifts? In the past, the forklift was entirely dependent upon its operator. In contrast, modern “smart” connected forklifts, fitted with elaborate GPS and wireless technology, allow the equipment to do much more, independently of its driver. A “smart” truck like this Doosan concept can signal when it needs to be serviced, monitor functions such as wheel spin and speed, detect idle time, and improve wheel traction. This results in enhanced performance and higher safety standards. Along with cleaner and recyclable vehicles, energy efficiency is a big part of being environmentally friendly. New technology will mean companies can monitor energy usage, leading to a reduction in the use of fuel. The removal of extended routes and unnecessary processes will mean that companies see a significant reduction in emissions, hours and costs. With the integration of automated decision making into forklift technology, the capacity to send data between trucks will prove useful in many ways, including the capacity to detect potential collisions. Monitoring will also make it possible to advise drivers of the ways in which their driving style could be improved. Sensors on trucks and in warehouses will also make it possible for drivers to monitor other forklift users, making the warehouse environment safer. One common cause of accidents is roll overs which this design aims to fix with weight distribution sensors and the ability to extend the wheelbase- nice work! Productivity and efficiency have always been the main focus of materials handling, but requirements for forklifts of the future will need to relate to changing consumption patterns. 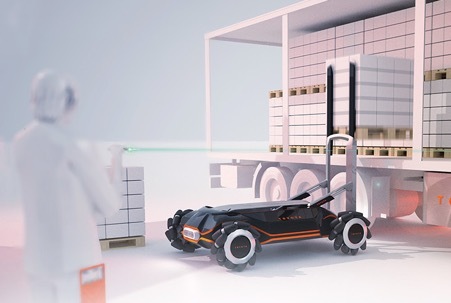 The use of robotic technology in handling materials is something that looks likely to occur in the longer term, as vehicles become more autonomous. Continuing advances in software make it likely that future companies will benefit from increased flexibility, with less time spent on planning and driver training. While robotic technology is currently expensive and not fully trusted in terms of safety, it is thought that in the future, costs will come down and more fully automated processes will be adopted. 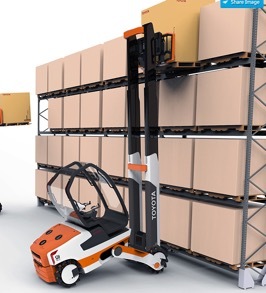 This Toyota design shows a controlled robotic forklift which is great for safety and accident reduction as the user can’t be crushed by goods falling over. The forklift industry has always been open to innovation and adaptability. The progression of material handling from a manual operation towards an advanced form of automation has been a gradual process, yet the needs of customers vary. There are undoubtedly many more groundbreaking developments yet to come. Focusing on the user experience, the piece was designed to make a tough and dangerous job a little easier and safer with enhanced functionality and ergonomics and striking design.The design features two joysticks in place of a steering wheel and pedals allowing better control, as well as a more open overall design for greater visibility. For added stability and safety, both the machine’s counterweight and cabin can be shifted. A totally electric drive also makes operation quiet and clean. 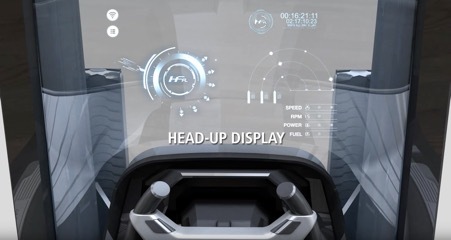 This all electric concept features a heads up display, memory seat, joystick controls and a heads up display as well as 360-degree rotation to enhance the user experience. Electric power and rechargeable batteries should also see a reduction in excess noise and emissions, enabling trucks to meet international guidelines and easily pass strict environmental standards.